I recently announced that I started an Amazon private label side hustle. I am super excited to share more about this side hustle as it's been a long journey. After I shared the news that I started an Amazon FBA private label side hustle, I received so much great encouragement and feedback from people. I'm really excited that so many people have followed along my journey, even since I launched Believe In A Budget back in 2015. I never would have guessed I would start a side hustle that had to do with Amazon. Go figure! I also had a few people let me know that I'm doing things wrong, and that's ok too. There are so many different courses and paths to take that all lead to the same goal, which is to ultimately have my own private label Amazon business. Similar to blogging, there are so many options and ways to do things, so what works (or hopefully works) for me, might not work for someone else, and vice versa! Even though Believe In A Budget and PinterestVA take up all my time, I was looking for another creative outlet. Basically, a passion project that I could start in my spare time that had potential to earn extra income on the side. I really liked the idea of learning something brand new that I wasn't familiar with, seeing if I could figure it out and then potentially earn a profit from it. These types of side hustles are really gratifying for me and I like the hustle and grind. I was also financially comfortable to make an investment in learning a brand new skill. 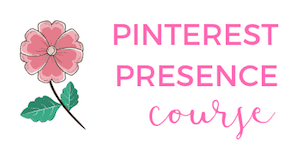 Similar to what I preach to potential students for my joint course Become a Pinterest VA TODAY!, you have to be financially and emotionally ready to invest in yourself to learn a new skill that can make you money. Learning a new skill can cost money, take time and requires discipline, so if you aren't ready to do all these things, it's probably not going to work out. But if you are to move forward, the payoff is that you can be very successful. Am I financially ready to invest in myself for my future? Can I intentionally set aside time to learn a new skill? Am I ready to try my hardest, hustle and be thirsty? Since I answered yes to all these questions, I was ready to commit to starting a new side hustle! I've been creating and designing my own physical line of products that are going to be available for purchase on Amazon. Eventually, I plan to sell on my own website, but right now it makes the most sense to tap into Amazon's audience. In technical terms, I started an Amazon private label side hustle business, which falls under part of the Amazon FBA umbrella. In case you didn't know (I didn't, ha! ), FBA stands for fulfillment by Amazon. Before I continue, I want to start by saying this is one of the hardest business models to start. It requires a decent amount of money upfront (for me anyways), so it was not something I could have started a few years ago. This is also an advanced level side hustle business. 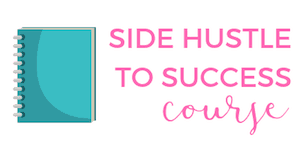 I got my start side hustling years ago, and still stick with several of the same side hustles that help me bring in extra income each month. 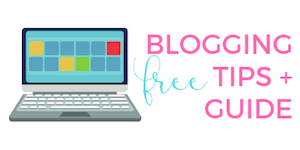 If you are new to side hustles and want to find some free side hustles that will help bring in some extra money on the side, then make sure to grab my cheatsheet by signing up in the box below. It's a list of all the free side hustles I have been using over the years. Typically, Amazon sellers are very, very private when it comes to sharing what their private label business is for fear they will be ripped off and underpriced. I've adopted the attitude that I'm going to proceed and share with you anyways. Plus, I've got a great lawyer who's helping make sure my brand is protected 👊! Picking my products was the hardest part of the entire process for me. I know that sounds silly, but it took me a couple months to hone in and be happy with my products. This doesn't include designing and making them either; it was simply picking them out and figuring out what path I wanted to take on this journey. When it came to selecting what to offer, I had a hard time finding products that would primarily be a good ROI (return on investment). After I factored in the cost to make the product, have it shipped to me, sent to Amazon and paid all the Amazon fees, I had to make sure the profit would be worth all the work! Side note – if you are thinking about starting a side hustle that can bring you in lucrative income, Believe In A Budget is a perfect example of starting a blog for barely any startup costs. I spent roughly $100 in my first year of blogging. It took me four months to make my first paycheck, which was for $60 (you can read my first income report here). I went on to make over $13,000 my first year of blogging in my spare time! That's an AMAZING investment and ROI in a very short amount of time. So if you don't think an Amazon business is for you, I suggest starting a blog or website as there are a ton of different ways to earn income for very low costs. Selecting and designing physical products was really challenging for me. I was a newbie, unfamiliar with how things worked and it was a lot of learning on the go. As I went through the course material that I had purchased that would teach me about Amazon, I had to remind myself that it was ok that I didn't understand things. I can't be an expert at something I know nothing about! I also mentioned in part one of this side hustle series that I wanted to create a brand that was personal. I didn't want to create a brand that I couldn't relate to or talk about; it needed to be products I would use in my daily life. The course didn't focus on making an Amazon business personal. It was strategic about determining products, what to look for, how to calculate costs, etc. Unfortunately, my brain doesn't work like that and there needed to be a personal connection between my brand and myself. This no doubt made my life harder and took me longer than normal to get things up and running, but I'm ok with that. The best way for me to pick products was to go about my daily life and see if anything caught my eye. I needed to see what stood out that I already was using, wanting to purchase or buying for other people. I focused on myself as well as those around me. I started paying attention to people shopping at the store and what they were purchasing. I was in full on research mode! I looked for items that were a necessity and a splurge. I also looked at items I used that were functional, long lasting and durable, but also made me feel good and were high quality. I also went into this process understanding that I needed to start with a few products and that hopefully one item would do well. There's a lot of trial and error with Amazon private label, so I also mentally prepared myself that all my products might not perform well. The goal is for one product to do well and expand on it! It was also important to create a product tree of all the products that I wanted to make down the road that would be part of the brand. So even though I'll be sharing some of the items I'm starting with now, there are more in the pipe line! It takes a long time to create products. Some of the products that I've been working on don't make sense to fully pursue right now. They are at a higher price point, which means a higher financial investment on my part and require a lot more attention to detail. In the beginning stages, it made sense to start with ‘easier' products, but it hasn't been easy, ha! There's been a lot of learning (and some frustration) in this process, so I selected products that didn't require a million features and options and that would (hopefully) be more straight forward to make. After I selected my products and started the design process, I had a pretty easy time selecting my company name and what I wanted my brand to be about. I was really excited about this part! For now, all my items are going to be manufactured overseas (more on that in part three of this series) with a wonderful team of workers. I wanted my products to be ethically sourced and all are handmade, making each one slightly unique. My primary contact and I are friends on Skype, talk to each other regularly and wish each other a happy holiday. We've even exchanged pictures of our dogs and what our office spaces look like, ha! It was also really important to show how my brand and products are used locally. These are all products that I and my product testers use daily, and I want everyone who looks at my company see how these items can be used in their lives as well. The vibe of my brand is small town meets the city, and I feel like so many people can relate to this lifestyle. One of the big areas I am focusing on is our photography! I want to focus on how we use these products with real life settings, not just a pretty picture. Some of my products can be used at the store or online, at home or on the go, at a country general store or at a big department store. Other products can be used for get togethers at the local coffee shop, a corporate business meeting or on the kitchen counter. So this is an area that I will be focusing on when it comes to social media and the new website over the next year to really explain what the brand is all about! With everything I've just mentioned above, you can probably tell by now that I've slightly veered off the Amazon course's path 😁. All of these things were just really important for me and I wanted to do it 90% the course's way, and 10% rebel and do it my way. Alright, let's talk about my new company! I'm nervous and scared, but it's time to talk about what I've been working on for the past eight months in my spare time. Please say hello to Harpeth Trading and my new products! 4. Faux leather notebook – coming soon – sign up here for a coupon! I am bursting with excitement to announce the initial line of products for Harpeth Trading! Everything was designed with myself, family and friends in mind. I treated everyone like a potential customer, including myself, when designing and making these products. Incase you didn't know, I am a big paper person. I talk about using a paper planner and notebooks all the time! I always keep one in my purse, have them for meetings, in my tote bags, in my car console for road trips and all over my house. I basically live for a good sketchbook or notebook, ha! 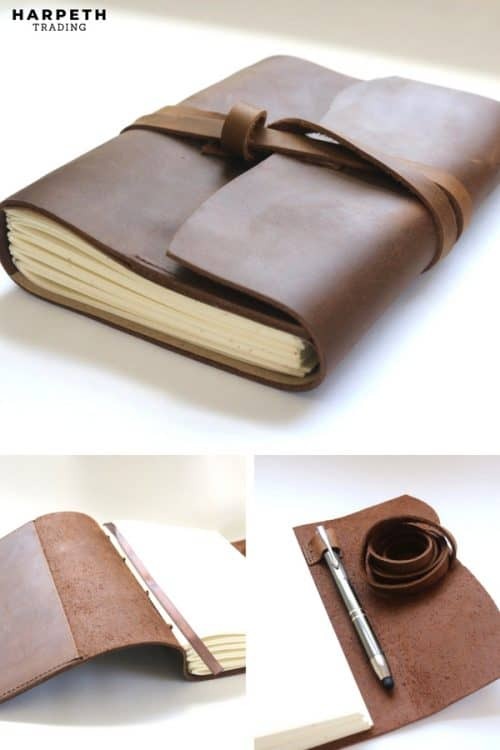 The first product I created was a leather sketchbook and a notebook! Prior to creating this product, the biggest struggle I had was finding a high quality and durable sketchbook or notebook. I wanted a sketchbook and notebook that had thick paper that wouldn't bleed through the pages. I like being able to use the front and the back of a sheet of paper, and would get really frustrated when the notebook paper was too thin or flimsy, and I could only use one side. I use my sketchbook and notebooks for multiple purposes. When I surveyed those around me, I found that seems to be the case as well. 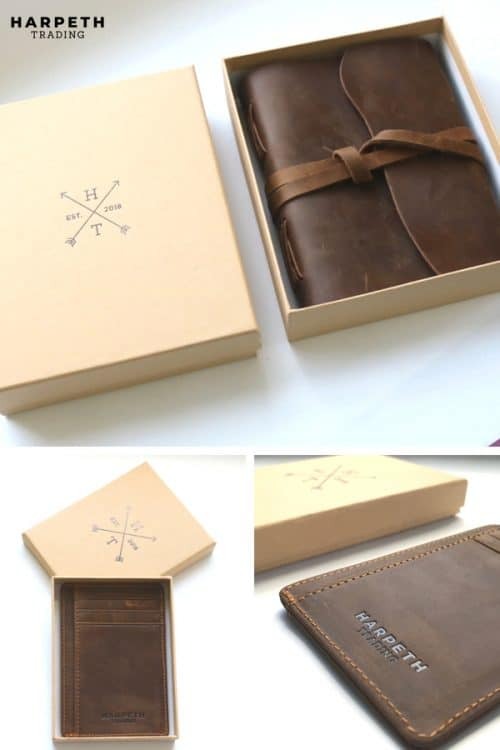 The consensus was to create a sketchbook and notebook that would be perfect for men or women, students, moms, teenagers, professionals, hobbyists, artists, list makers, etc. I wanted a product that would be durable and be well made. I wanted a high quality material on the exterior that would age nicely over time. For the vintage looking leather sketchbook, It took a long time to find the right leather that could get scuffed or scratched, but gently buffed out and obtained that vintage vibe over time. Finally, I wanted something that would be long lasting and could be saved and tucked away or put on the bookshelf, as opposed to tossing a notebook in the garbage when it got full. I've saved tons of notebooks over the years of ideas and work notes for Believe In A Budget and Pinterest VA, as well as have old sketchbooks full of my designs and drawings from when I was an interior designer (yup, I got my BS in interior design and was a designer before starting this blog – a job I loved!). I love getting them out to look up old work goals, designs and all the things! With my background in interior design, I was comfortable working with textiles and the design process and knew exactly what I wanted – I just had to find it. After sourcing the material and testing it out, I felt confident with my selections. Next I wanted to really customize the sketchbook. I added a ribbon, an interior pocket to store things, and heavy, thick creamy paper. Even selecting the paper thickness took time so I could test out the paper and bleed-through with pens, markers, sharpies – you name it! All of these things were missing from sketchbooks and notebooks that I had been using prior, and it was amazing to be able to put all the things I used into one product! Next up, I created two different wallets! This was a really surprising area for me to enter, mostly because I worked on a male wallet and a unisex wallet. But it made total sense! Every guy around me had an old, bulky leather wallet that looks like it needed replaced, ha! And all my girlfriends and I were always complaining about whether or not we should take our purse or just a wallet and phone out for the night. 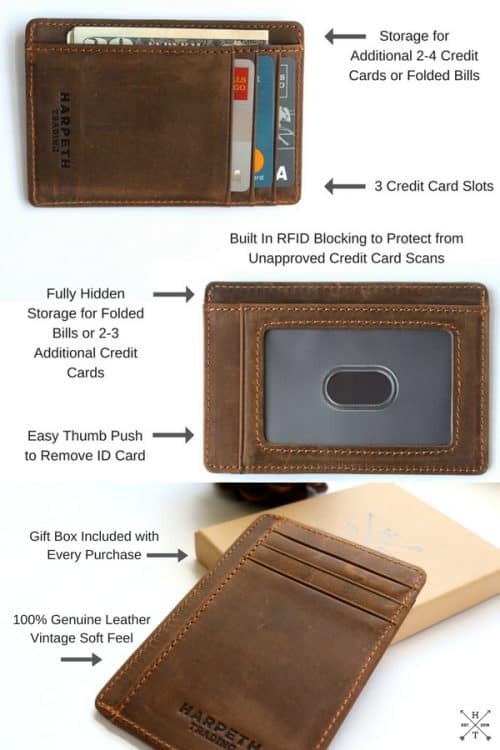 This wallet was also perfect for shopping, on the go and any instance where you need an ID, credit card and even cash, without wanting to carry a purse. During my research phase, I asked every single one of them how many cards they had in their wallet, and out of all their cards, how many did they really use. Pretty much every single guy said they only use a few cards and a lot of their cards were either old and things like reward cards they no longer used (they switched to providing a phone number instead at retail or grocery checkout). The unisex wallet was a surprise favorite of mine as well. There are so many quick trips to the store or if I'm out where I just want to have my phone and wallet and not use a purse. This little skinny card holder wallet has been perfect! 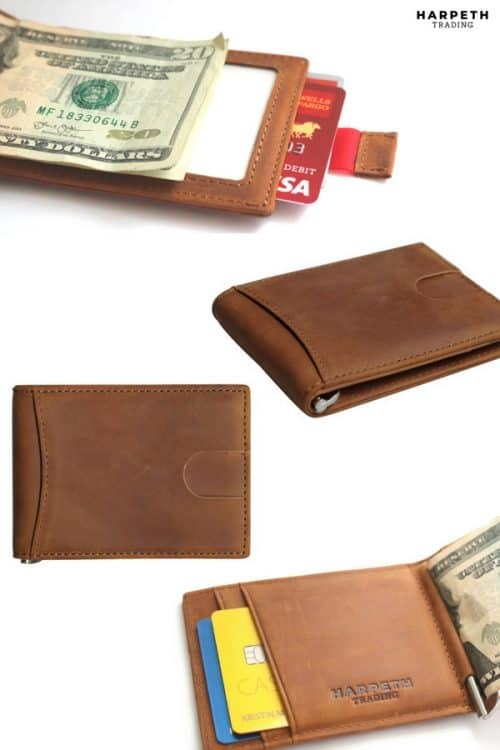 I had females and males test this card holder wallet and it's been a big hit. I'm having a hard time switching back to my bigger wallet after using this for the past couple of months! In addition to the slim unisex wallet, I've also had guys use the men's wallet (it comes in 2 colors so far, yippee!) and they are awesome. The width of the men's wallets are only half inch thick, which was something I really wanted. I have seen men using wallets that were like two inches thick and looked cumbersome and heavy, ha! These wallets have so much storage, are lightweight and super functional, but slim. Every person who has used this wallet loves how thin they are but can still hold 8-10 cards plus cash! And yes, part of the reason the launch process took longer was so I could test out all my products and have other people test the products. I wanted to make sure everything was high quality, durable and functional. Finally, I wanted my brand to have really nice packaging. I love packaging and the product presentation in general (wrapping presents at Christmas time is my jam), and I know having the right look can make such a difference. I wanted every purchase to feel special, whether someone was shopping for themselves or buying a present for someone else. 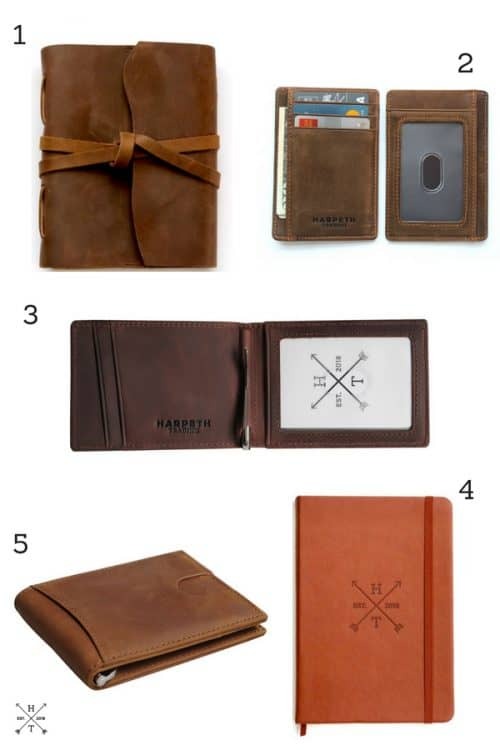 All of products are packaged extra careful using a heavy duty, custom box that included the Harpeth Trading logo on it. This was an extra expense, and maybe not the smartest expense in the beginning stages, but one I was really firm on having added to my brand! It's always a nice feeling opening a present that is packaged nicely, and this eliminates the gift giver from having to find a box, etc. One important issue when starting this business was to be able to give back with every purchase made. While I've always privately been involved with helping other and paying it forward, having the opportunity to give back with every purchase made sounded super exciting. I knew it would be easy to track sales and donate a percentage of every purchase to help others less fortunate. Part of Harpeth Trading's name comes from the Harpeth River that flows all around my town here in Middle Tennessee. Like so many other people that love the water, whether it's the ocean, lake or river, we have spent many weekends on the water, hiking, fishing and exploring. We've brought our dogs, met up with family and friends and spent lazy days floating down the river. Never once did we worry about the water being dirty or contaminated. While we take the clean water and river for granted and use it as a source of entertainment, there's a lot of communities that don't have clean drinking water. That's why it only made sense to partner with a non-profit company that focused on clean water. I'm excited to announce that a portion of every purchase will go to charity: water, which helps provide clean drinking water and wells to communities in need all over the world. This company believes in the 100% model, which means 100% of our donations go to helping communities in need, which makes me feel confident about every donation made. I'm excited to see how much we can give back and help pay it forward. Wow, that was a lot of information and I still have so much to share with you. This has been a long journey and there are so many things left to discuss. In addition to the above, I'll be sharing more information in this side hustle series. It's so unique and different for me to write about, and so many of you have questions and general enthusiasm. I can't wait to keep writing about this. 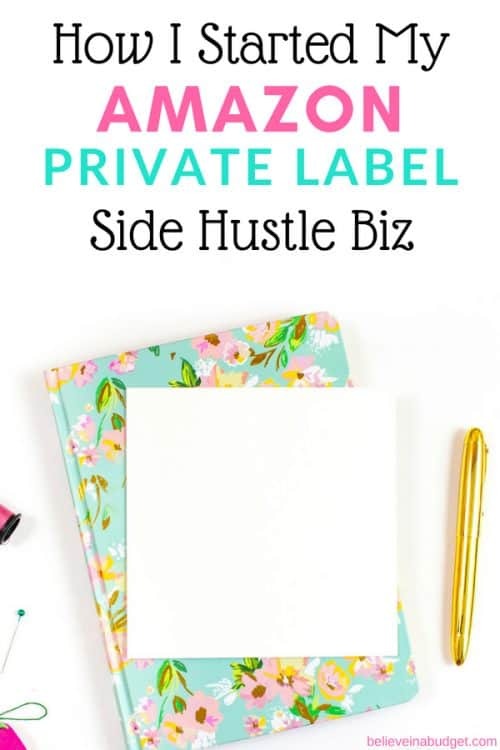 I hope you like my new blog series about my Amazon private label side hustle! You have very nice products. On the wallets, just make sure that the driver’s license fits. I work for the DMV and so many of the men have trimmed their license because it doesn’t fit in the ID holder. Trimming the license makes them void. I suggest that the ID section be made a little larger. You could use this feature as a selling point! Thanks! I personally test all the products fora pretty lengthy time period incase I need to make adjustments, and hand them out to my family to test as well. All the ID holders fit licenses quite nicely – I had no idea there were wallets out there that didn’t hold ID’s well. You’ve probably seen your fair share, ha! It’s definitely worth mentioning, thanks! Check out ZZ Pendana….Don Schlesselman is a friend of mine. 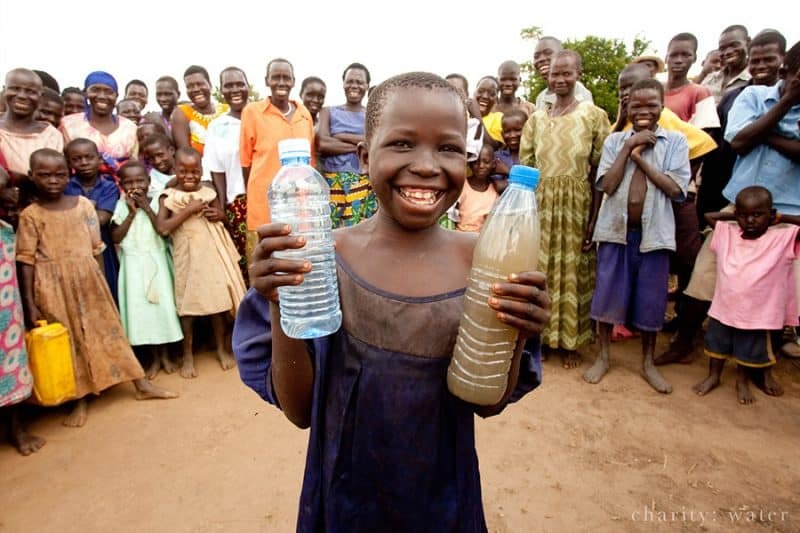 He started the foundation to bring clean water systems to Africa . He goes at least a couple times a year. Kristin, congrats! I wanted to sell a few products on Amazon back in 2016, but instead, I went full-time on my blogging and business. It seems I should try Amazon again. However, after several years, I have been running a successful blog and co-founder of a successful company. I like the way you generously giving out information without expecting anything in return. I would love to interview for our new blog post titled Successful bloggers list. Please let me know if you could spare a few minutes? Thanks. Thanks, I’m glad to see other hustlers out there too 🙂 Sure, feel free to reach out at [email protected] believeinabudget.com! Kristin, thanks. I just emailed you the details. Congratulations. This is awesome news. As others have said, this is inspiring. Thanks so much, I’m super excited! I’ve enjoyed reading about your new journey ~ thank you for sharing it with us 🙂 I love that you created practical useful products (I’m a paper and pen girl too LOL) and I double-love that you’re giving to a charity with this as well. This is so inspiring. Thanks so much for sharing! Beautiful pieces! Congratulations on your new venture and good luck to you. It looks like you put a lot of thought into what you wanted to do. Very impressive!